Now that it is my final week here at Beaufort and Spencer Hill, I have been reflecting on all the trips I embarked on this summer. I thought it would be fun to do a wrap up of my favorite times, along with a few ideas for anyone venturing into New York City longer than a weekend. So, without further ado, here are my top ten experiences, perfect for an avid reader in New York City. While I tried to avoid including any huge tourist attractions in this list, The Met is arguably the most famous museum in the city, and it’s the largest. It is extremely overwhelming for first-timers but is a must-see. For some reason, I refused to visit this museum on any of my prior visits to the city, but I knew I had to go this summer. I spent four hours wandering the halls and still missed half of it. If you are into art in any sense, there is a gallery for you in The Met, and I wholeheartedly recommend it. Plus, the iconic steps are a great place to enjoy your book and coffee. Always check online before you go anywhere in case they have times where admission is free or reduced! General admission at The Met is pay-what-you-wish if you are a resident of New York or have a student ID from a college in New York, Connecticut, or New Jersey. Since I was here in the summer, I figured I couldn’t miss Coney Island. I thought because I wasn’t going to ride on any of the rides I wouldn’t get as much out of the experience, but pick a gorgeous day, head down to the boardwalk to enjoy the sound of the ocean and the feel of sand between your toes, and you’ve got one flawless day in front of you. Spread out a blanket and devour a hotdog from Nathan’s as you immerse yourself between the pages of your next favorite read. Free, although good luck staying away from the shops and eateries. I visited this museum twice – once for a film screening, and then again to see the actual museum. Definitely check out its website to see what movies are playing while you are in the city; depending on the type of screening, some of the actors or crew members might be there for a Q&A afterwards! The museum has a cute café and some comfy seating throughout that makes for a cozy reading space. Free on Fridays from 4 – 8 p.m. Screenings are an additional cost. Anyone with a sweet tooth, this one is for you. When you get off the subway on 59th Street, you are less than a 10 minute walk to three major sweetshops: Sprinkles Cupcakes (there is an actual building but also a cupcake ATM outside if you want to avoid human interaction), Dylan’s Candy Bar (with a major list of funky desserts and one of the best milkshakes you’ll ever drink), and Serendipity 3 (frozen hot chocolate, anyone?). Whether you stay in the shop or head to Central Park (less than a 10-minute walk), you’ll be able to fully savor both your book and your treats. Depending on what you want to spend your money on, Sprinkles is the cheapest option, Dylan’s is more middle-of-the-road, and Serendipity is the biggest splurge, but it’s worth it. If you do decide to go to Serendipity, be prepared for a wait. This peaceful area is filled with blooming flowers in the spring and summer. It has many secluded areas with seating, along with a charming field fit for a picnic date with your next novel. While it may be a bit busier when it has free admission, I had no problems finding plenty of places to get away from the crowds. How could I make a list for book lovers without including The Strand? This bookstore is a must-see for anyone who has picked up a book in their lives. Three floors of floor-to-ceiling shelves and stacks of every genre of book imaginable. The first floor also has some spot-on merch, including t-shirts, magnets, socks, and pins with fantastic slogans. Obviously entry is free, but we all know you aren’t leaving there empty-handed. This walking path from the Meatpacking District to 34th Street has only been around for a few years, but it is already rising in ranks for a major Manhattan attraction. If you go on a gorgeous weekend day, you’ll find yourself in the midst of a high volume of sight-seers. Instead, go on a nice weekday, spread out in a lounge chair, and soak in the sun with the view of the bay on one side and the Manhattan skyline on the other as you work your way through your TBR pile. Free, unless you stop at any of the numerous food vendors or restaurants on and along the path. The New York Public Library gives daily tours, showing a bit of a behind-the-scenes look at the building, its history, and its possessions. The tour is perfect for literary nerds because while it is just an hour long, it is packed with fun facts that will potentially blow your mind like they did mine. Free tours are available in the Stephen A. Schwarzman Building at 11 a.m. and 2 p.m. Monday – Saturday to the first 25 people who show up. I got there around 1:15 p.m. on a Friday and was one of the first to get tickets. The wait was the perfect excuse to meander around the impressive gift shop. I am not a Central Park girl. Sure, walking around and through the expanse of greenery is always enjoyable, but it is too crowded and distracting for me to relax. Flushing Meadows Corona Park in Queens is my favorite park that I have visited, and I have been to a lot this summer. Since it is not in Manhattan, it is not too busy, and it is large enough that you can find a place to hang out very quickly. The park also houses the Queens Zoo and the Unisphere, which is incredible to see up close. The only downfall is how far it is if you are living in Manhattan, but you can always read on the subway! The day I went to Governor’s Island was arguably the best day of my summer. Governor’s Island is a tiny island around the Statue of Liberty – Wall Street – Brooklyn Bridge area. Spend the morning kayaking and ride a bike around the island’s small, 2.5-mile perimeter. Hike up Outlook Hill for an unforgettable view and wander around what was once Fort Jay, then finally curl up on a hammock in Hammock Grove with your favorite book. 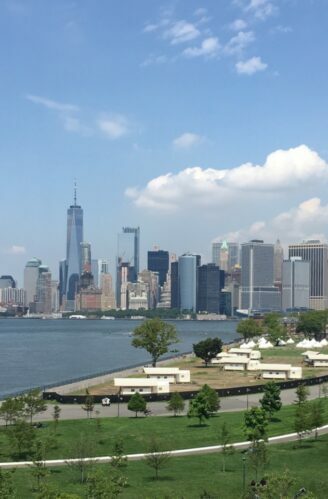 If you are in NYC anytime between May and October, put Governor’s Island on your To Do list! The ferry is free on the weekends if you go before noon, and kayaking is free on Saturdays from 11-4. Bikes range in price, but everything else listed above is free! As I wrote this post, I felt like a walking advertisement for some of these places, but I cannot recommend them enough. I wish I had a few more weekends to go back to revisit a few of my top sites because one day simply wasn’t enough time with each of them. I hope this list gives you some inspiration as you explore the Big Apple!